Direction, left or right, how are you viewing the cards? The card is before me (say the 6 of pentacles), a man facing towards me is holding scales in his left hand and with his right hand gives 4 coins to one of two beggers at his feet. Is the begger considered to be on the left side of the card or because he is on the right side of the merchant, is he the begger to the right. Is the merchant looking to the left of the card or is he looking to his right? Now the 6 of cups, if the children turn and look at the house then St. Andrew's cross will be to their left as most books discribe, but if they were to turn towards me instead, the cross remains on the left of the card but is to the right of the children. Am I to consider the scene first with everything on it as either being on the right or left side of the card and when people are shown the perspective is still from me the viewer so nothing is "on their right" but on my left and the left side of the card? In the 6 of pents, is the merchant giving money to a begger on his right or a begger on the left side of the card. Thanks if you can help me here. orientation from our point of view: The Right Hand Holds. stances, and from that, through all the deck, we find ours. to be shown that there are many exceptions and no fast rule. just opened ourselves a nice can of ambidextrous worms. holds their suit symbol in their right hands. the other three are somewhat ambiguous on this aspect. The Ace symbols are all being held in the right hand. 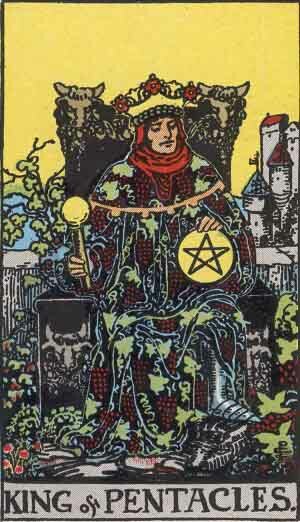 Why does this King have his Pentacle in his Left hand? And what's up with the Ambidextrous Pages? Reading your post again, I see I kind of went off in my own direction. I think the people on the cards are real, and we are seeing their world. Not "psychology test patterns" but real places in the ~ Land of Tarot. Which means, that all you have to do is ask the people in the cards! I was thinking about all the discussions about Pamela Coleman Smith working in the theater and about the "stage cards", and I decided I would treat it as such. Okay, here's where I stop making sense. If I'm an actor on stage (which occasionally I am) and the director tells me to move left, I know he means my left because those are the unrwritten rules. This allows him to get up on stage and show me exactly where to go and still mean left. It's always from the actor's point of view to avoid confusion, and that's why we call it "stage left". I did get a little flustered when after a few years on the stage I moved to the house to do a little stage managing. Now I don't know my left from my right (kidding...most of the time). This is just the way I see it because that's what was drilled into my head for so many years, but I'm not sure it matters either way. Actually, I think "the merchant's left" and "the right side of the card" mean the same thing. You're specifying who's left and right and it seems very clear to me. I asked the cards and they told me that each holds it’s own reality and that when I know better I will do better. It is just that I have started “studying” and have found different authors have different points of view, (what a surprise!) and was wondering if anyone had a “rule of direction”, if there is a rule, or if anyone had ever thought about this right or left issue, or perhaps I am just being obtuse. I am one of those dyslectic people who have to think extremely hard if asked to point left or right so I am easily confused when told that right is my assumed left or vis-à-vis. I have come to understand that when reading the cards it is important to recognize “left” can represent the past, the unconscious, or the need or desire to look into these aspects and “right” can represent the future and conscious awareness. I feel I need to adopt a consistent theory but am having a hard time understanding the concept of “this is the left side of the card” but “this is the pictured person's right but everything to the right of them is on the left”. Hemorrhaging as I type! I think I would like to hear from you in the “know” which way to go before I decide as needing to relearn in the future maybe difficult for someone like me! p.s. . Just so you know who I am: it took me over 1/2 hour just to see that all the ace symbols were in fact held in right hands not left and right! (much placing of the cards face to my chest and pen holding!) but I still can’t tell you if the grey cloud with the hand holding the ace of pentacles is coming from the right (like the AS) pointing left (held up to my chest looking down), or from looking at the card on the table is coming from the left side of the card pointing to the right. OH! But it must mean something if the AC & the AW are coming from the opposite direction. Yes? So what is it? Is there a rule of direction? and the Ace of Coins features a single, large circular design. Maybe this was done to show these two as "compatible"
just as then the other two, handless Aces, would be kin.